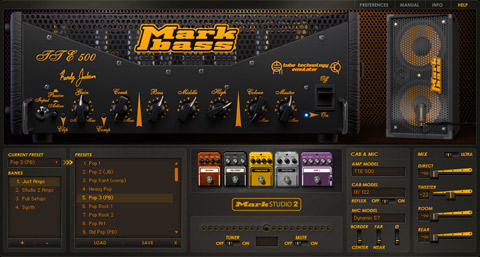 Mark Studio 2, Software Amp Simulator from Overloud. 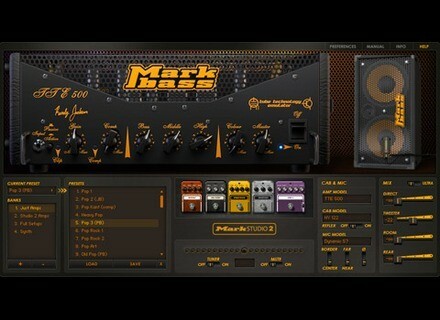 Overloud has released Mark Studio 2, the new version of its Markbass amplifier simulation plugin. 9 Markbass cabinets: STD 151HR (rear-ported 1x15"), STD 152HR (rear-ported 2x15"), STD 104HR (rear-ported 1x15"), STD 104HF (front-ported 4x10"), STD 106HF (front-ported 6x10"), Classic 108 (sealed 8x10"), Traveler 121H(front-ported 1x12"), New York 804 (front-ported 4x") and New York 122 (front-ported 2x12"). Signal path designed to make it easy to balance the Direct (plugin) input, Line Out (amp direct Out) and Mic Output levels. Parameters can be automated in the plugin version. Mark Studio 2 is available as a standalone application and as a plugin in VST, RTAS, AAX and AU format for Mac OS X 10.5 or higher and Windows XP or higher. Both 32-bit and 64-bit versions are natively available. Full version: €107 (€129) / $137 ($169). Upgrade from Mark Studio 1: €57 (€69) / $77 ($99). Crossgrade from TH2: €77 (€99) / $97 ($139). Manx XS-2 Manx has released the XS-2 VSTi polysynth for Windows; a replacement to the now-withdrawn XS-1. Voxengo AcuDrums Update Voxengo announces the update of the Voxengo AcuDrums drum sample library. Ohm Studio Beta Available Ohm Force is presenting its real-time collaborative music workstation, the Ohm Studio.